Neck pain and back pain are among the most difficult conditions to deal with effectively. Most people experience some form of back pain at some point in their lives, and at times the pain becomes unbearable. Even mild continuous pain is life-limiting. Diane works directly with these issues in her multi-method approach. Posture education is the primary focus, along with a home plan of gentle exercise and breathing co-ordination. The long-term benefits of effective neck and back pain management are tremendous. 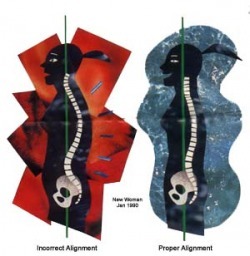 This is the work to do if surgery seems daunting, and if intuitively you know that there may be something you are doing in the body that creates imbalance and muscle tension, even if you do not exactly know what it is.